Ray Acheson is the Director of Reaching Critical Will. She provides analysis, research, and advocacy across a range of disarmament and arms control issues. Ray leads WILPF’s work on stigmatising war and violence, including by campaigning for a nuclear weapon ban treaty and challenging the arms trade and the use of explosive weapons and armed drones. Ray is also on the Board of Directors of the Los Alamos Study Group and represents WILPF on several coalition steering groups, including the International Campaign to Abolish Nuclear Weapons (ICAN). She has an Honours BA in Peace and Conflict Studies from the University of Toronto and an MA in Politics from The New School for Social Research. Ray previously worked for the Institute for Defense and Disarmament Studies. She was a 2018 UN Women Metro-NY "Champion of Change". Allison Pytlak is the Programme Consultant for Reaching Critical Will. She contributes to the organisation's monitoring and analysis of disarmament processes as well as its research and other publications, as well as liaises with UN, government, and civil society colleagues. Prior to this role, Allison worked in policy and advocacy with the Control Arms coalition focusing on the Arms Trade Treaty. She has also worked with Religions for Peace and Mines Action Canada on a broader range of arms issues, and has significant experience in campaigning and advocacy, research and writing, project management and multilateral treaty negotiations. Allison has a BA in International Relations from the University of Toronto and an MA, also in International Relations, from the City University of New York. She is an expert with the Forum on the Arms Trade and a 2018 UN Women Metro-NY "Champion of Change". Katrin Geyer is the Reaching Critical Will Associate. She supports the organisation’s monitoring, advocacy, and research on a wide range of disarmament issues. 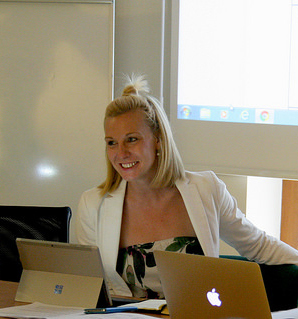 Prior to this role, Katrin was first an intern and then a Consultant to WILPF’s Human Rights Programme. She has an Honours BA Liberal Arts degree from the University College Maastricht and an MA in Human Rights from the University College London.